I’ve heard many a horror-story about flying with breast milk, from security agents who forced moms to dump out milk, to broken bottles. I’ve also made a few mistakes myself, once causing me to throw out several days of expressed milk. I’ve taken countless business trips while breastfeeding my five children, and these are my tips for successful traveling with breast milk. Your breast pump does not count as a “carry on” item, because it is a “medical device.” So bring your regular carry on luggage, but be prepared to explain several times that your pump is a medical device. Your breast milk cooler does count as a carry-on. Bring a good water-tight cooler, plenty of ice packs, and all your empty bottles or breast milk storage bags. Your freezer packs and breast milk storage containers may be more than 3 oz. Declare them at security, even when they are empty. Ask the TSA agent to change into clean gloves before he inspects them. After security, consider sealing your cooler with duct tape. When you book your hotel, be sure to ask for a room with a freezer. Sometimes you can turn the thermostat to the coldest setting on a hotel mini-fridge and it will be cold enough to freeze breast milk. If you do not have a freezer in your room, ask at the hotel desk to have your breast milk cooler stored in the hotel freezer. I have done this many times and always been accommodated without questions. It does mean that every time you pump you have to carry your fresh milk down to the hotel desk, ask for your cooler, put your milk in, and have the cooler returned to the freezer. When you are flying home, you will need plenty of ice packs to keep your milk frozen through the duration of your trip. I never have enough, so I stop at a Starbucks once I get through security and ask them to fill my cooler with ice. They have always obliged. Another option is to buy dry ice for your cooler, which you will be permitted to take through security if you explain that it is for breast milk. 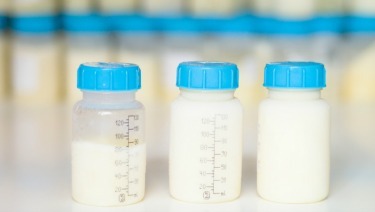 You may fly with an unlimited quantity of breast milk, per TSA rules. When going through security, always declare your breast milk. If your milk is frozen solid, the TSA agents don’t have to do any special tests. They just visually inspect the milk. Be sure to request that the TSA agent put on clean gloves before touching your cooler. If your milk is thawed or in a semi-solid state, the TSA agent will have to do a special test on each bag or bottle where they wipe the bottle with a piece of paper and put the paper in a machine that tests for explosives. If you need to pump in an airport, ask if there is a breastfeeding lounge or baby care area. If not, find a family restroom with an outlet. It is possible to mail/ship breast milk, which is useful if you are on a long trip away from your baby and need to get some milk home for baby. Shipping breast milk is much more expensive than flying with it. You can ship breast milk on dry ice via FedEx. Dry ice, a Styrofoam cooler, and a box for shipping can be purchased locally and possibly delivered to your hotel. Search online for a local supplier. The dry ice is so cold that it can make plastic breast milk storage bags or bottles very brittle, and they can break in shipping. It is best to seal your breast milk bottles in zip-lock bags and then pad them with crumpled up newspaper inside your cooler of dry ice. You can print out a FedEx shipping label online. I have heard of people shipping breast milk on regular ice via overnight US mail. The US Postal Service does not permit dry ice in the mail. Although this is a much cheaper option, there is real risk that your milk will thaw en route. These recommendations may not apply to international travel. If you are flying internationally, contact the consulate of your destination country to determine their regulations. Be sure to check out the official TSA guidelines for traveling with breast milk.